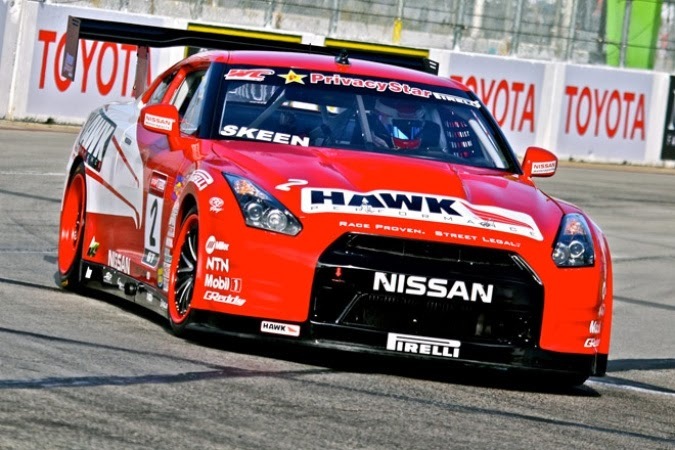 Mike Skeen, CRP and Hawk Performance return for 2014 with a Nissan GT-R in Pirelli World Challenge GT. The car has never really done that well in World Challenge. In 2010, Brass Monkey Racing ran a couple of cars all wheel drive in GT and struggled. In 2012 CRP, and Hawk Performance started to run a Nissan GT-R, rear wheel drive, and they too have struggled with the car. Mike Skeen is fast as proven by his wins in the CRP Corvette, but the GT-R program has never really got with it. Austin Cindric, son of Penske Motorsports President Tim Cindric, also has conducted some of the off-season testing done in the team's Hawk Performance Nissan GT-R. Austin, eager to get seat time in a GT car, took little time to get used to the Hawk Performance Nissan GT-R. The young Cindric began his racing career in Bandoleros and then advanced to Legend cars at Charlotte Motor Speedway before moving to the Skip Barber Formula Series. The 6-foot-2 Cindric made his USF2000 debut last year in a car owned by Andretti Autosport. The youngest driver ever in the open-wheel series, he captured two top-10s and acquired the Tilton Hard Charger Award in the season finale at Houston. CRP Racing is a leading edge racecar engineering company with a winning pedigree that offers full service race car prep, full track setup, restoration and custom fabrication, and shock, dyno and design services. Owner Nicholas Short has made a career out of motorsports with experience in IndyCar, NASCAR, Trans-Am, Group C Endurance Racing, Baja desert racing, Vintage SVRA and HSR and the Pirelli World Challenge series. Looking forward to seeing the car out for the 2014 season. First race is March 29-30 in St. Petersburg, Florida. The races are live streamed at World Challenge TV.